It is an ancient method of gardening using an intercropping system which grows corn, beans, and squash crops simultaneously in the same growing area that is typically a rounded mound of soil, often called a hill. Corn is the oldest sister. She stands tall in the center. Squash is the next sister. She grows over the mound, protecting her sisters from weeds and shades the soil from the sun with her leaves, keeping it cool and moist. Beans are the third sister. She climbs through squash and then up corn to bind all together as she reaches for the sun. Beans help keep the soil fertile by coverting the sun’s energy into nitrogen filled nodules that grow on its roots. As beans grow they use the stored nitrogen as food. 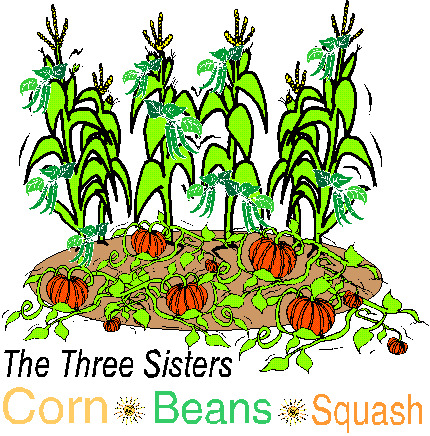 How do I grow a Three Sisters Garden? In mid-Spring clear a sunny garden area of grasses, weeds, and large stones. The area should be roundish in shape and at least eight feet across. Cover the area with a few inches of compost or well rotted manure. Turn the compost in to loosen the ground and create a moisture retaining growing medium with increased fertility. Water it well. Check the growing area frequently over the next few weeks to remove any sprouted weeds. In late-Spring sow about seven or eight corn seeds in the center of the growing circle, in a ring pattern, spaced out about six inches from each other. Plant the corn seeds an inch under the soil, firm the soil above by patting it down with the palm of your hand. Water the growing mound well. The corn will sprout and begin to grow in about two weeks. After the corn has grown to about ten inches high, using a hoe or hand trowel, pull up some soil from the growing mound around the base of the corn stalks. The corn should not be buried entirely, it’s upper half should be above the soil that has been mounded around it’s stems. The corn will send roots into the mounded soil to hold it steady and upright in the wind. After mounding soil around the base of the corn stalks sow about a dozen pole bean seeds in a ring pattern six inches outside the corn stalks. Push the bean seeds about an inch under the soil and firm the ground above them by patting it down with your hand. Water the growing mound well. The beans will usually begin to sprout in about 7-14 days. 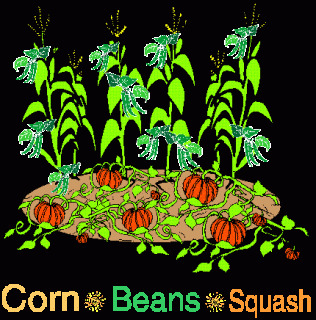 About a week after the beans sprout, sow six or seven squash seeds in a ring about 12-15″ outside the beans. Push the squash seeds about an inch under the soil and firm the ground above them by patting it down with your hand. The squash seeds will sprout in about a week. As the corn grows the beans will begin to climb, you can help them early on by wrapping the bean vines around the corn stalks. The squash will begin to grow it’s vines and the large squash leaves will soon cover the growing mound and shade its soil. On occasion help the squash continue to cover the mound by turning the ends of it’s vines towards the center of the mound. Water the mound well during weeks where there has been little or no rain. When can we harvest our Three Sister’s Garden? Corn may be harvested while in it’s green corn stage, but tradtionally it is left to ripen and is harvested in Autumn. The cob is sun dried and stored for winter use. To harvest green corn observe the silky threads coming from the tops of the ears, when the silk is dry and a dark brown color the corn may be harvested. To remove an ear of corn, hold the stalk a few inches below the ear. Pull the tip of the ear toward the ground until it snaps off. Beans may be eaten fresh or allowed to mature and dry on the vine. Fresh beans can be harvested when the pods are firm and crisp, but before the seeds within the pods have begun to swell. Pick beans in late morning after the night-dew has dried from the plants. This helps to prevent the spread of bacterias which can harm the plants. Pick the beans carefully to avoid bruising or snapping the growing vines. Bean plants will continue to flower and more bean pods will develop if they are harvested before bean seeds can mature. Squash should be picked only after its skin has hardened thoroughly. Be careful to not damage or break off the stem of the squash…this can wound the squash and it will begin to rot. Cut the stem 3-4″ from the fruit with a sharp knife. Allow the squash to sit in the sun for a few days to cure and the stem to dry. Store squash in a single layer and not touching each other, which can foster rot. Squash can last at least two months, depending on the variety. Enjoy growing your Three Sisters Garden!